Gildan Softstyle Shirts. Very soft, preshrunk jersey knit available in mens and womens version, regular collar and V-neck. You can pick the colour of the shirt and logo (RED LOGO ON THE GREY SHIRT OR GREY LOGO ON THE BLACK SHIRT). With our unique imprint method we print onto a very thin vinyl that is then heat pressed right into the garment with our commercial grade presses; the result is a very soft feel and long lasting imprint (up to 50 washes without cracking/fading). 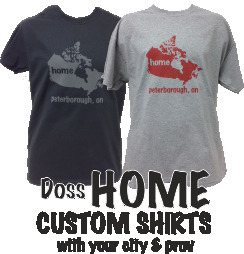 Unique aspect of this shirt is that you can ask us to imprint ANY CITY and PROVINCE you call HOME under whichever colour Canada logo you pick. The ultimate custom shirt! Mens crew neck shirts are Gildan 6400, V neck is 64V00. Womens crew neck shirts are Gildan 640L, V neck is 64V00L.